Animal organs. Digestive system. Salivary glands. Atlas of plant and animal histology. Species: A: rabbit; B y C: rat. Technique: A: Submandibular salivary gland. Haematoxylin-eosin. B: Accesory salivary gland. van Gieson. C: Sublingual salivary gland. Haematoxylin-eosin. Salivary glands are exocrine glands showing acinar compound organization (see figure). There are three pairs of large salivary glands in mammals: parotid, submandibular and sublingual. The secretory portions of the parotid and submandibular are outside the oral cavity, but their large excretory ducts ends in this cavity. 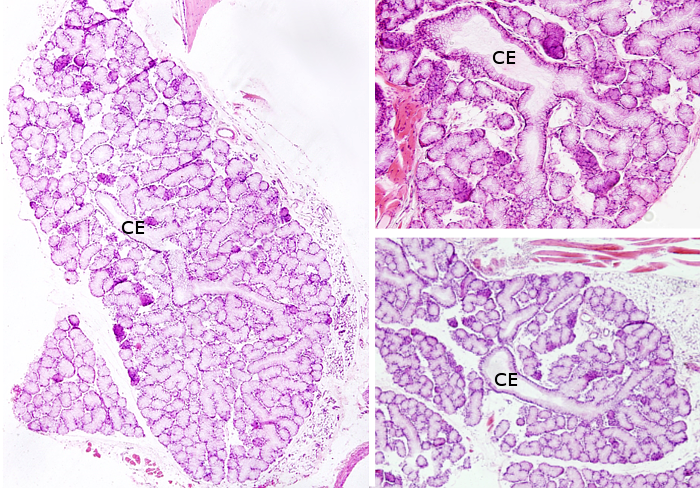 These large glands show the typical architecture of compound glands and are organized in lobules separated by connective tissue walls. Nerves enter through this connective tissue. Salivary gland secretions kept moist the surface of the oral cavity. The remaining salivary glands are known as accesory or minor salivary glands, which are distributed through the oral cavity and have their secretory parts under the mucosa of the oral cavity. Regarding their location, there are lingual, palatines and buccal. Buccal salivary glands are divided in yugal, molar, retromolar. Minor glands release their content continuously to the surface of the oral cavity surface so that they produce moist environment and protect the epithelium from the tooth rubbing. The secretory unit of salivary glands is the acinus, a bag-like structure with a small lumen. Some acini may contain only serous secretory cells that release salts, glycoconjugates, enzymes and other proteins. Other acini may be composed of only mucous secretory cells that release glycosaminoglycans, proteoglycans and glycoproteins. Some acini, known as mixed or sero-mucous acini, may contain both serous and mucous cells. In histologycal sections of mixed acini, mucous cells appear partially surrounded by serous cells arranged as demilunes (referred as crescents of Gianuzzi). However, this is actually an artifact of the histologycal processing. In non processed tissues, mucous and serous cells form a single secretory layer. Mixed acini of Sublingual salivary gland. The serous secretory cells (demilunes delimited by black lines on the right picture) surround the mucous secretory cells. This distribution is an artifact produced by the histological processing. Serous and mucous cells should be at the same level forming the the acinus wall. Types of acini: mucous, serous and mixed. 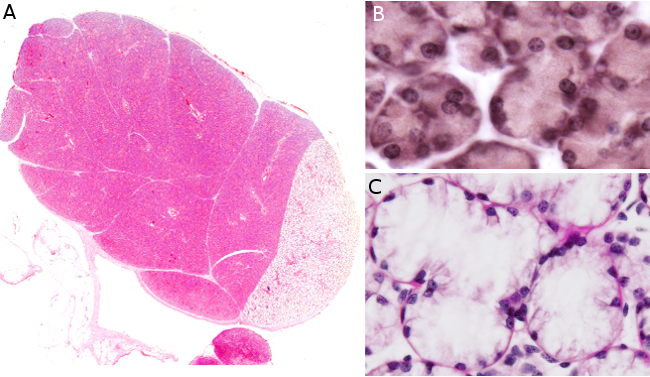 On the right picture, mixed acini with the serous cell demilunes are artefacts caused by histological techeniques (modified from Krstić, 1989). Serous secretory cells are pyramidal-shaped, with a wide basal surface. Many graanules can be observed in the cytoplasm, which are secretory vesicles known as zymogen granules. In general staining like haematoxylin-eosin, the basal part of the cell is strongly stained with haematoxylin because there are well-developed rough endoplasmic reticulum, whereas the apical part is stained with eosin due to the higher protein concentration. Mucous secretory cells are more rounded in shape and store their secretory products in granules known as mucinogen granules, poorly labeled with general staining, but strongly stained with histological methods for carbohydrates like PAS. Consecutive sections of accessory salivary glands of a rat. A. van Gieson staining. B. PAS-haematoxylin staining. PAS-haematoxylin stains the mucous acini with strongly reddish color due to their high content in carbohydrates. Secretory acini release their content through a system of excretory ducts. From the acini to the opening into the oral cavity, the excretory salivary ducts are divided in three regions. Intercalar ducts are made up of flat to cuboidal cells that directly collect the compounds released by secretory cells of the acini. Externally, there are myoepithelial cells coating these ducts. It is though that intercalar ducts contain stem cells for maintaining the population of acinar cells and of other regions of the excretory duct. Intercalar region is transformed into the striated duct, which are composed of more columnar cells. This region is specialized in secretion of some compounds and reabsorption of electrolytes. The basal membrane of striated duct cells are folded and contain many mitochondria. That is why it looks like striated. The last part of the duct is the excretory duct proper, with walls made up of several layers of columnar cells, sometimes bearing microvilly in their apical surfaces. This excretory region is subdivided in two regions, with the final consisting on only one duct that allows the secretory compounds to reach the oral cavity. Secretory products clearance from the acini lumen, and later from the excretory ducts, is produced by the contraction of the myoepithelial cells, which are found between the secretory cells and the basal lamina, and between the excretory duct epithelium and the basal lamina. Salivary glands are innervated by both sympathetic and parasympathetic nervous systems. Thus, secretion is produced under a wide variety of circumstances. The type and amount of secretion may be modulated by these nervous afferents. Mastication also influences the secretion of salivary glands. Parotid glands are the largest of the salivary glands. They are subcutaneous and located in the face, before the ears. Their excretory ducts open near the upper second molar teeth. Secretory cells are serous and release a low dense aqueous solution containing many enzymes and antibodies. A distinct feature of parotid glands is the great amount of surrounding adipose tissue. Submandibular salivary glands are found beneath the floor of the oral cavity, near the lower maxillary bone. Their excretory ducts open into the oral cavity in location close to the frenulum of the tongue The acini are mostly serous, with a small proportion of mucous and mixed acini (seromucous acini). In rodents, they are only serous. Sublingual salivary glands are found under the floor of the oral cavity, more anterior than submandibular glands. They have many excretory ducts that end in the submandibular duct or independently in the floor of the oral cavity. Their acini are mostly mucous, and some mixed acini, but it is rare to find serous acini. Saliva is the result of the secretory activity of salivary glands, each of them with its own contribution. Saliva is an aqueous complex solution containing water, glycoproteins, inorganic ions, enzymes for degrading carbohydrates, immunoglobulins like IgA, mucins and growth factors. The functions of saliva are to maintain moisten the oral cavity surface, start the degradation of some molecules, and soften and lubricate the food to facilitate swallowing. It is the first step of food digestion, and at the same time is an antimicrobial defense. Mucous part of sub-maxillary gland. Mucous acini connected to the initial part of the excretory duct (CE). Amano O, Mizobe K, Bando Y, Sakiyama K. 2012. Anatomy and histology of rodent and human major salivary glands. Acta histochemica et cytochemica. 45: 241-250.